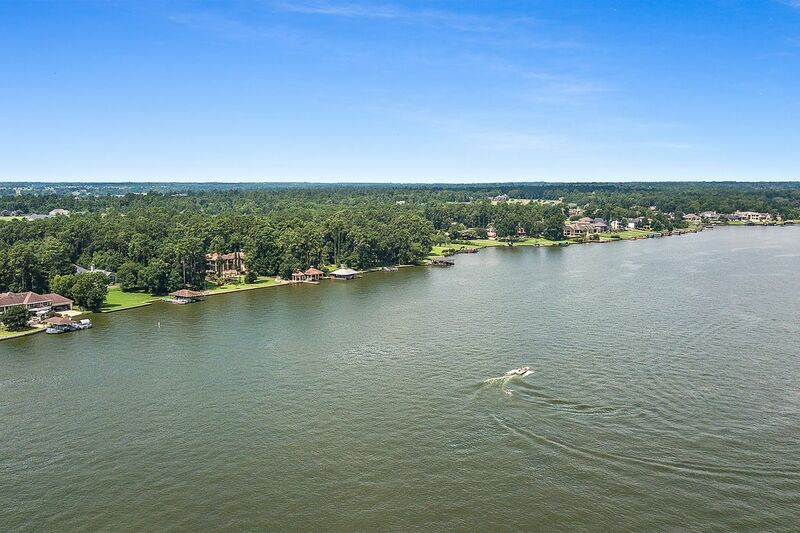 19182 Laketree Drive, Montgomery, TX 77356 | Martha Turner Sotheby's International Realty, Inc. 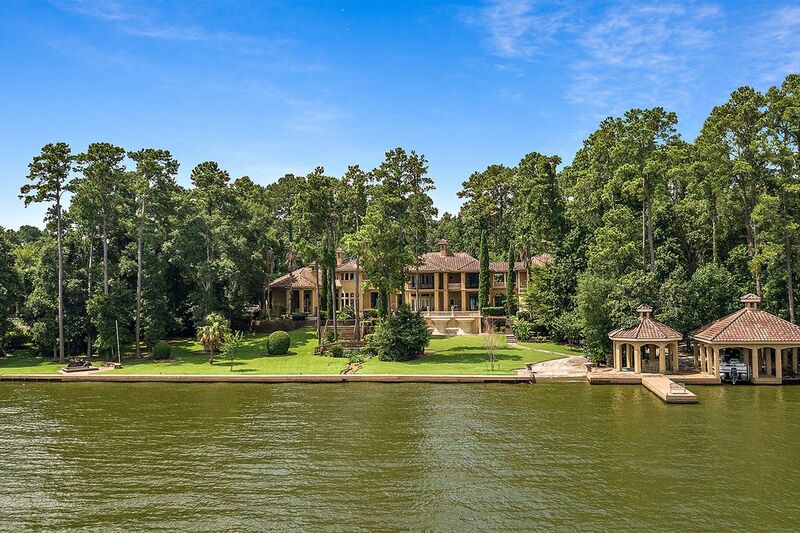 The Italianate Villa is discretely nestled among the trees from the front; it soars majestically and demands attention from all on Lake Conroe! 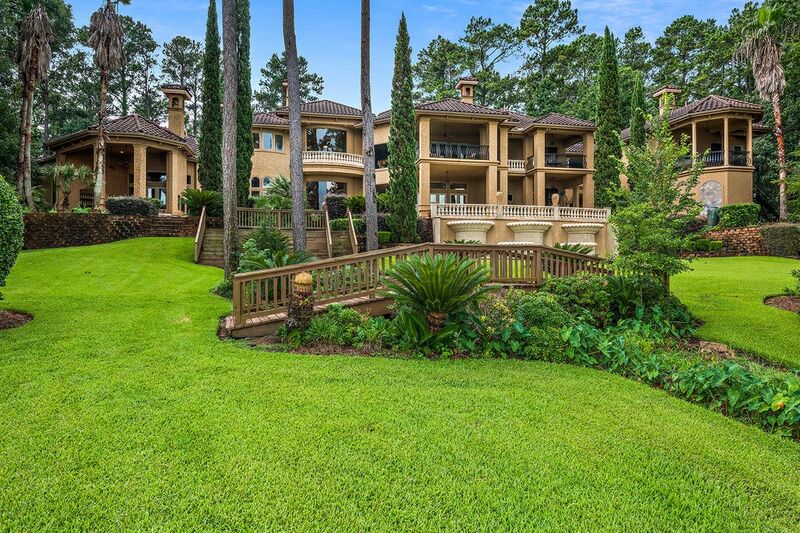 Outside is equally fabulous with multiple decks and porches that overlook the pool and the majestic fountains that have had 9 new pump replacements. The pool as well has had the water heater replaced and a new sweep. 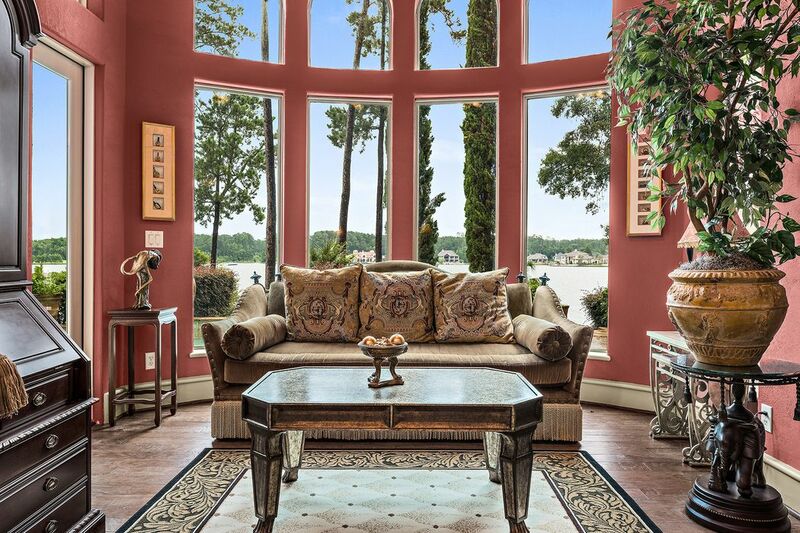 Unwind in the main balcony area located off the main living area with breath taking views of Lake Conroe. 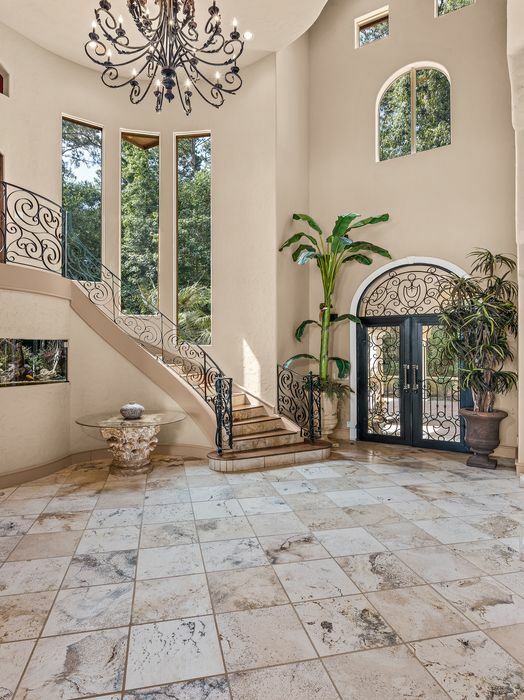 Elegant design, the main foyer of the home features high ceilings with recessed lighting, accompanied by a statement chandelier and marble floors. 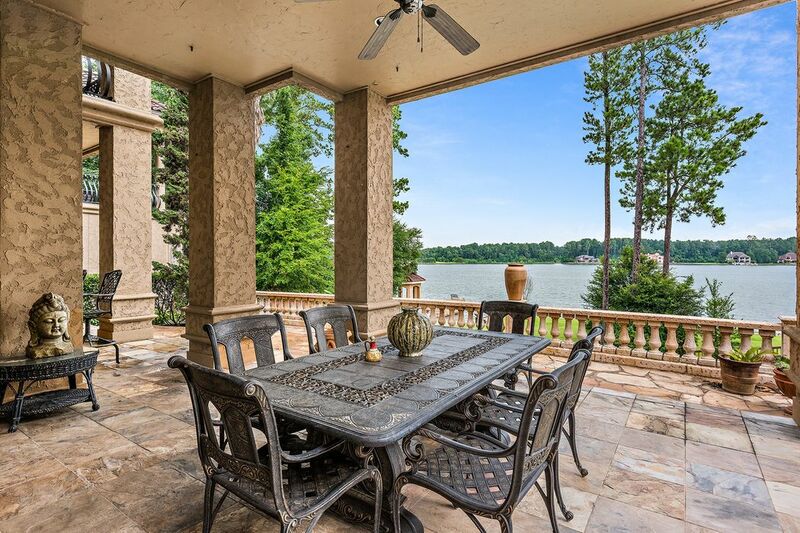 Enjoy the romantic evenings on this private master balcony with exceptional views of the lake. 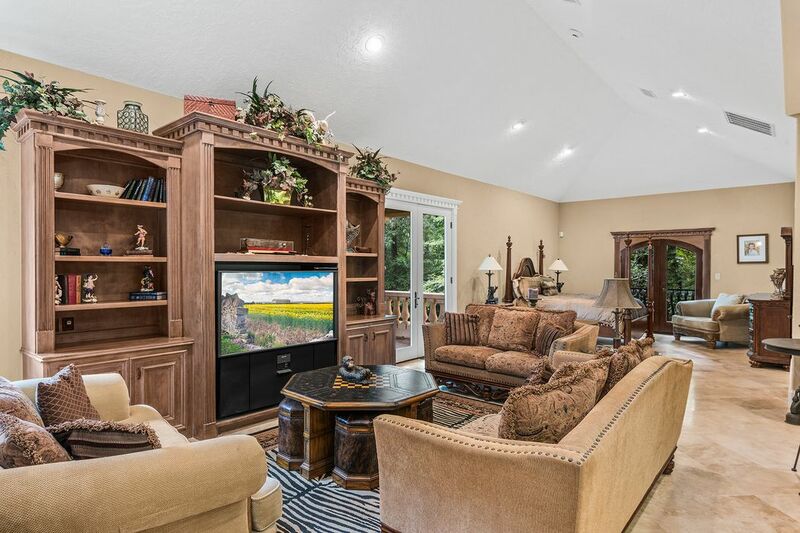 Located off the foyer and rear to the dining room is the charming formal living room with breathtaking views and a crackling fireplace. 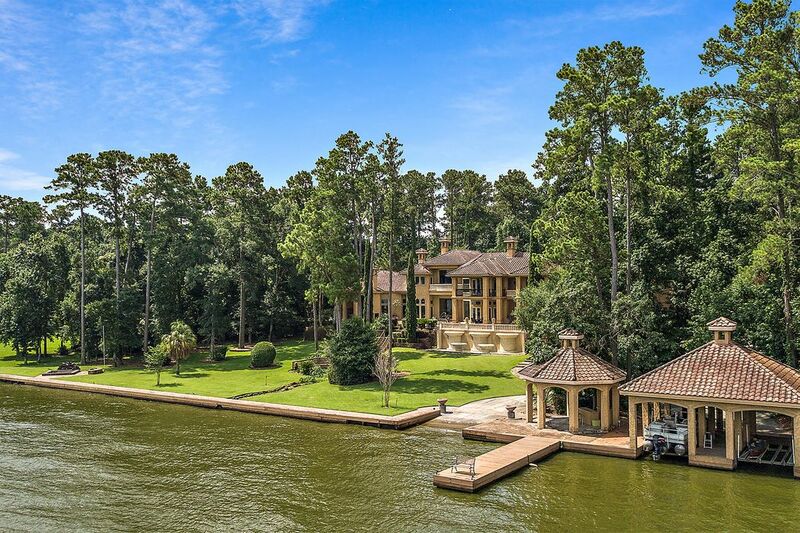 With nearly 450 feet of bulkheaded shoreline, it is the rival of all lakefront residences. Of course, it boasts its own dock for loading and unloading watercraft and a lift for convenient boat storage. 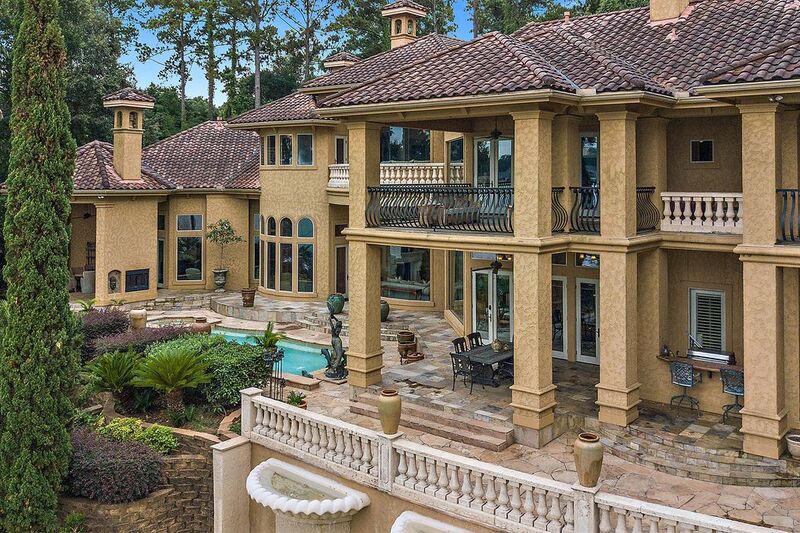 This magnificent estate situated on 6.5+ private acres that is surrounded by the most lush landscaping offered on Lake Conroe. 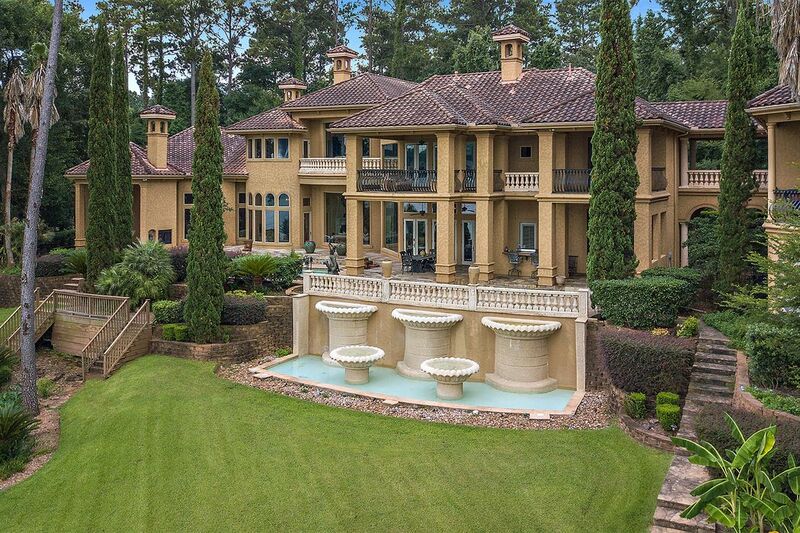 A view like no other of the enormous estate and grounds. The manicured grounds burst with professional lighting and irrigated by renewed water sprinklers. 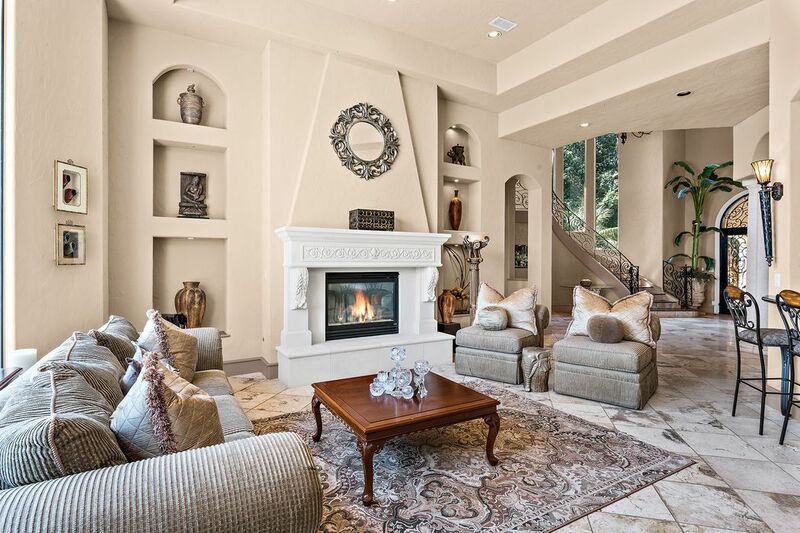 Another view of the formal living room is located off the kitchen with recessed lighting, 12 foot ceilings,marble tile and surrounded gas log fireplace with custom mantel wainscoting. 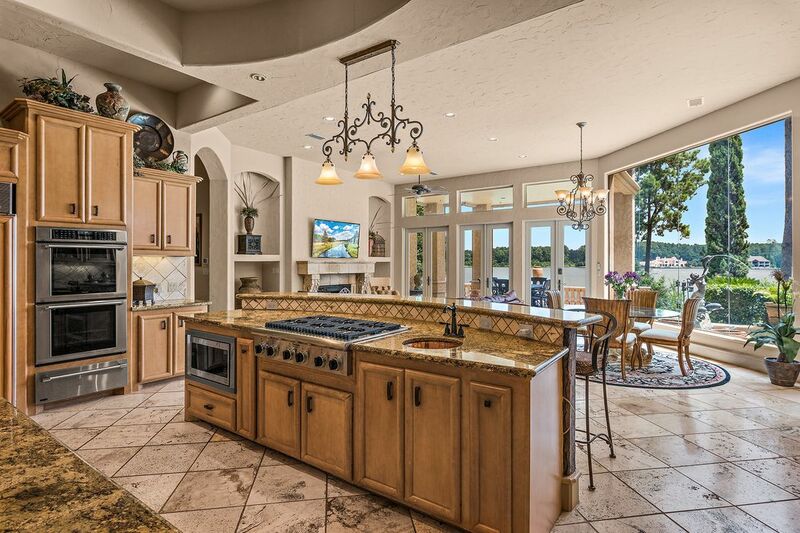 Outstanding chefs kitchen includes stainless steel appliances, double ovens, teak cabinets and a new dishwasher! Very ideal for entertaining, hosting and prepping! 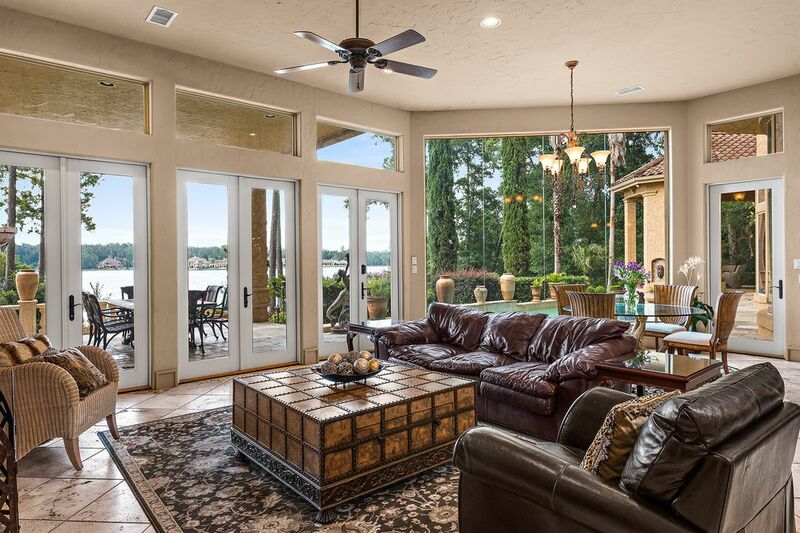 Talk about an Open Floorplan with marvelous views of Lake Conroe! 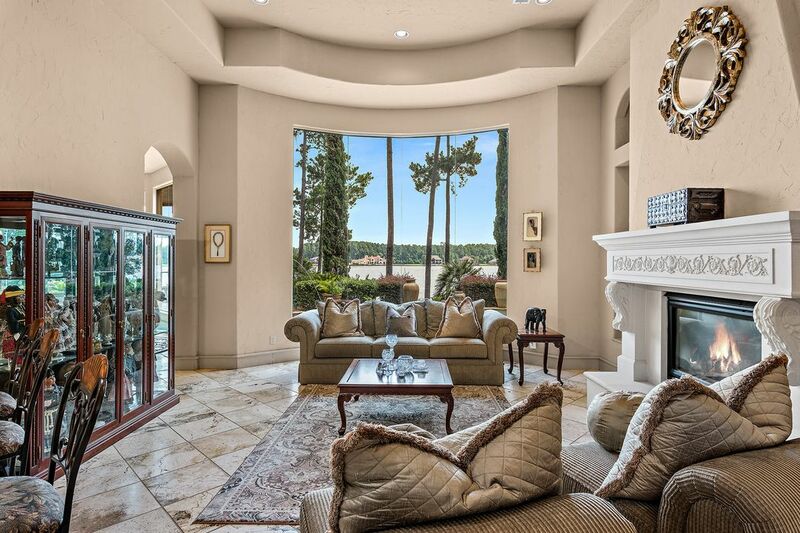 Soaring windows and soaring ceilings showcase this main living space. 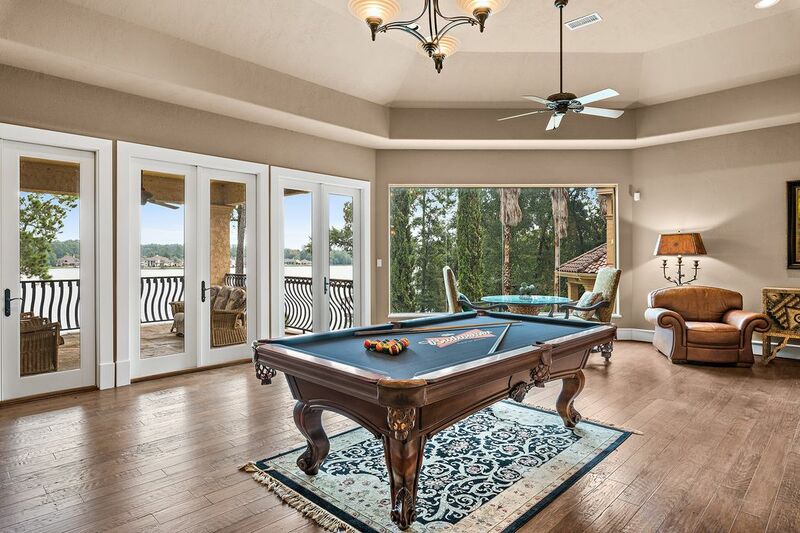 Richly appointed, the main living room opens to the kitchen and obvious stunning views. The wall of windows really applaud the marble floors that flow through out this first floor. 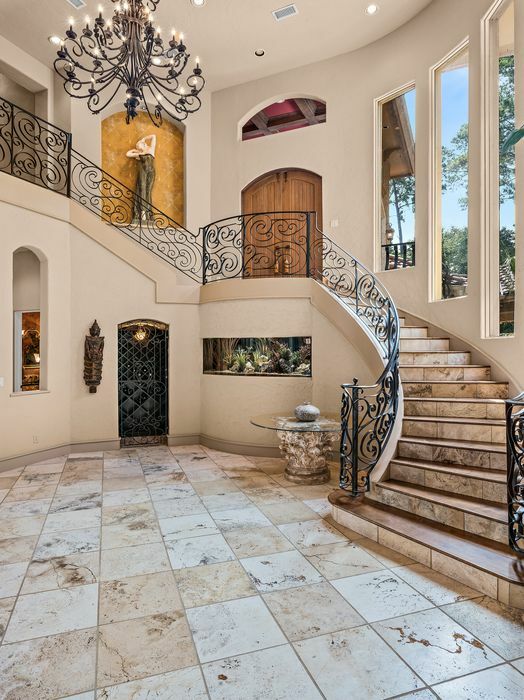 Second staircase leads to the upstairs level and is coated with Tile imported from Isreal. Designed with efficiency this home is air conditioned and heated with a new HVAC unit, 4 hot water heaters and a central central vac system too! Utility rooms on both levels. Work out room with separate entry attached to the master wing. 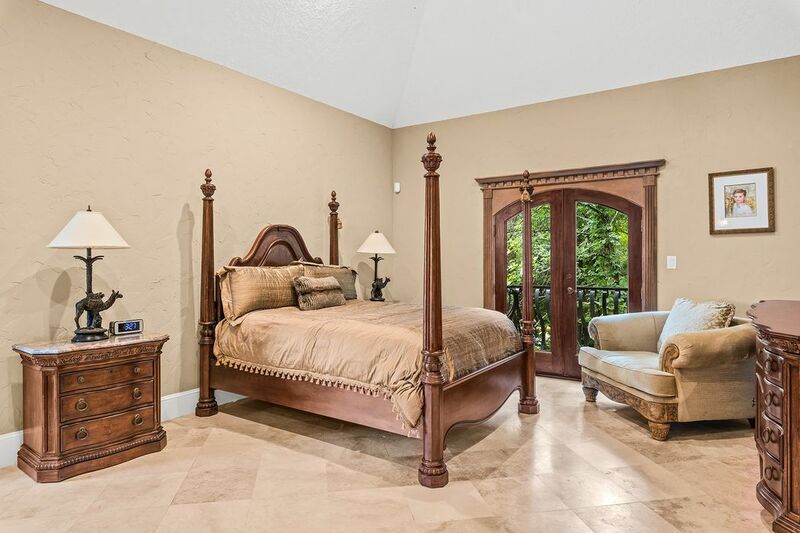 As you make your way to the master suite locates another formal sitting area with miraculous views! 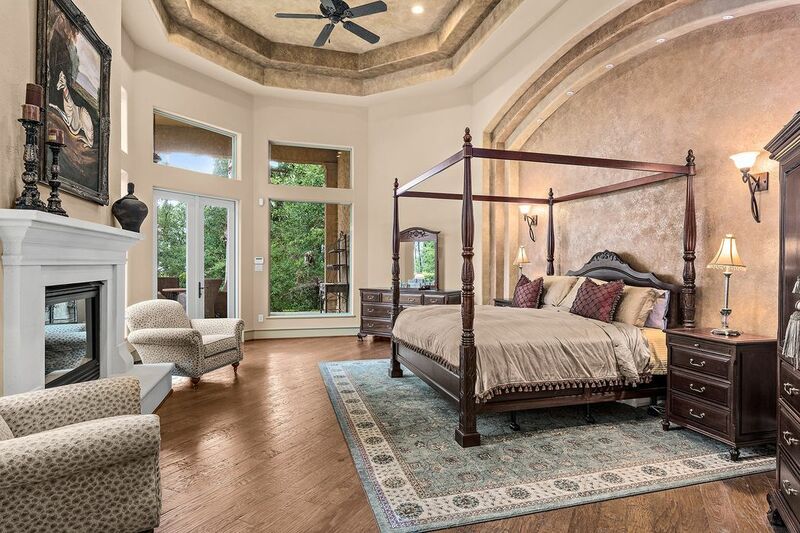 Master suite or master retreat... 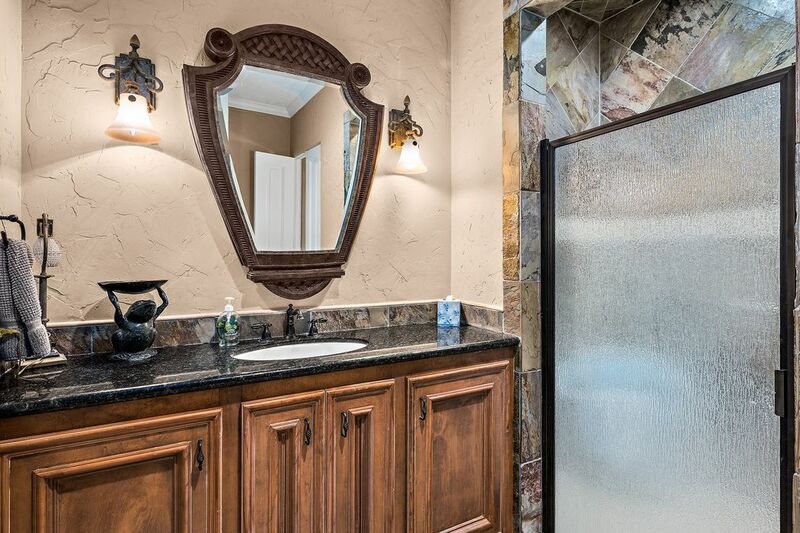 This en suite master bathroom is unbelievable. 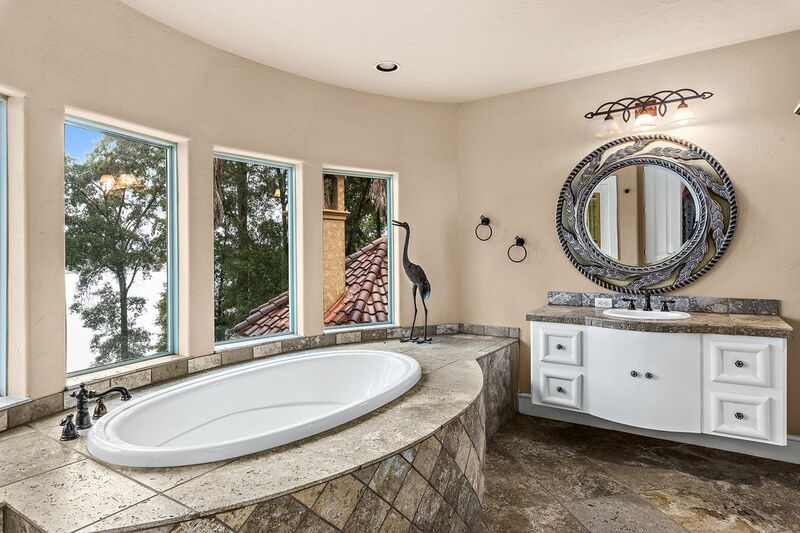 An over-sized whirlpool tub is perched next to a crackling fireplace that is two sided so you'll be able to enjoy it in either shower or soaking in the tub. 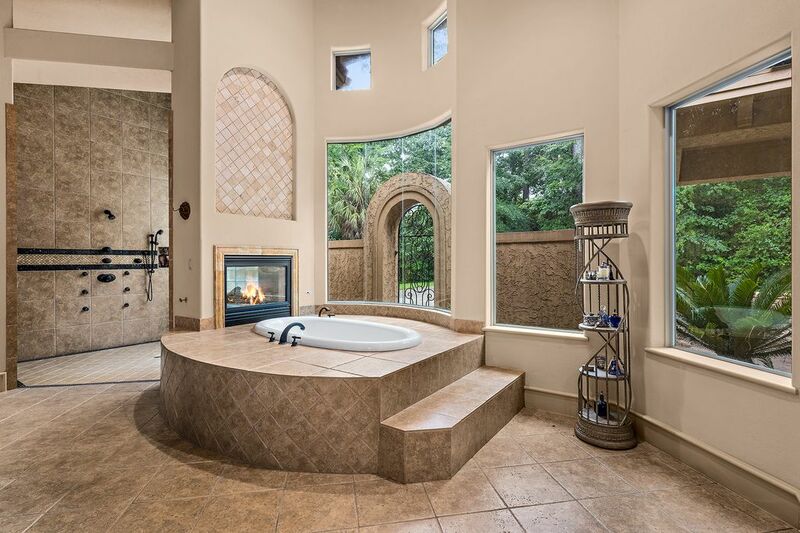 Another view of this dream like master bath and shower that is separated by the lovely fireplace. 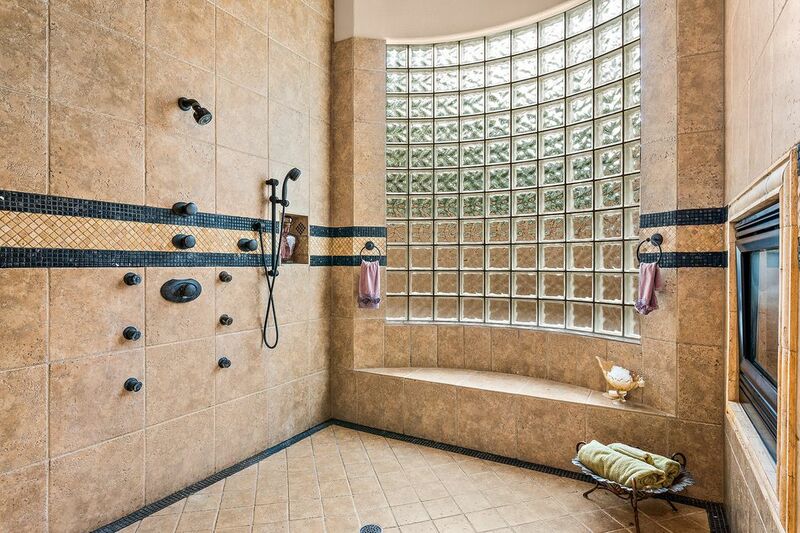 Enormous walk in shower with dual shower heads, a sitting area, and privacy glass. 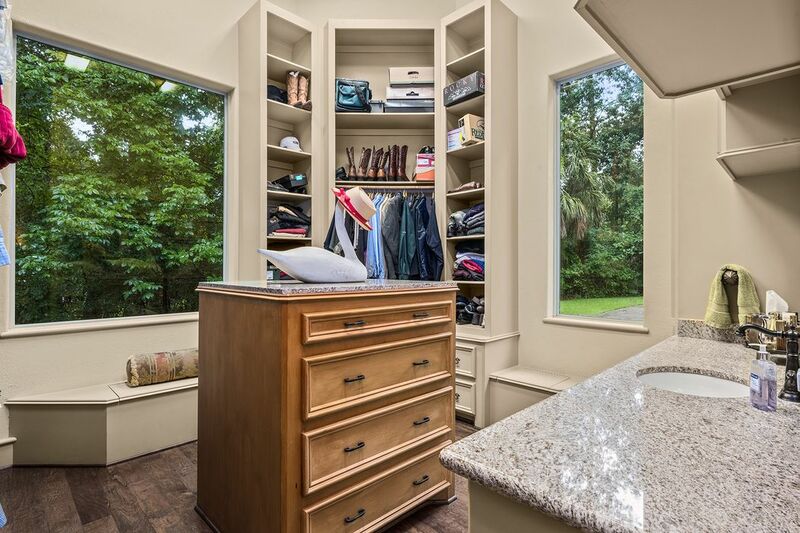 One of the TWO amazing master closets with a convenient private sink/coffee bar. Tucked midway up the spiral staircase is the executive office and a flickering fireplace with its own private balcony. Resort style private secondary bathroom includes the over-sized tub surrounded by tile work that continues to the furniture like vanity area and bathroom floor. 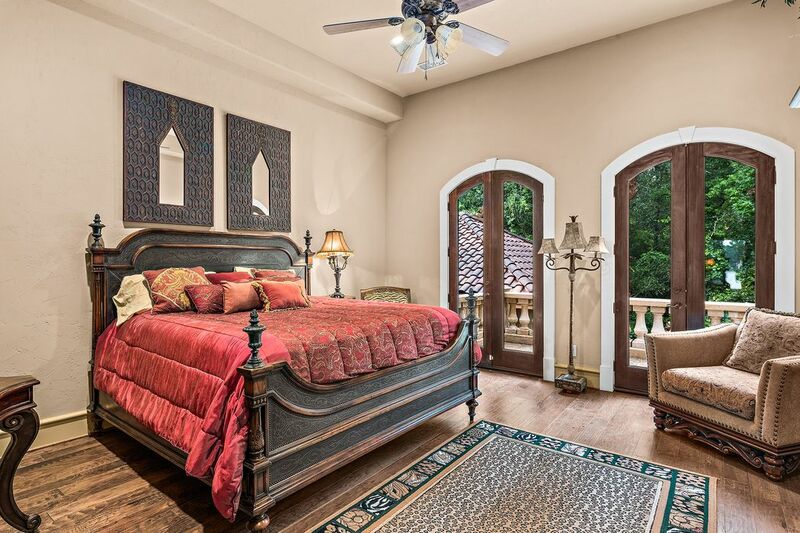 Upstairs guest room, attached balcony and en suit bathroom provide all the comforts expected in a luxury home. 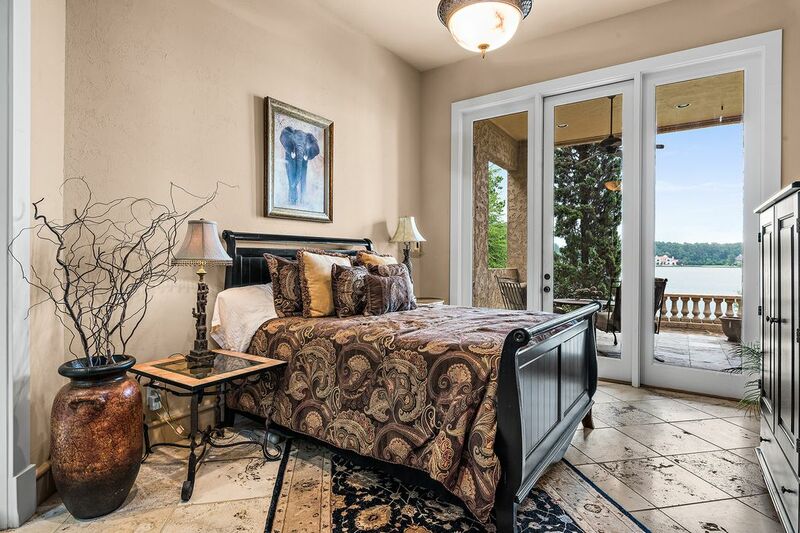 Another upstairs secondary bedroom with private bathroom, wood floors, french doors and private balcony views! 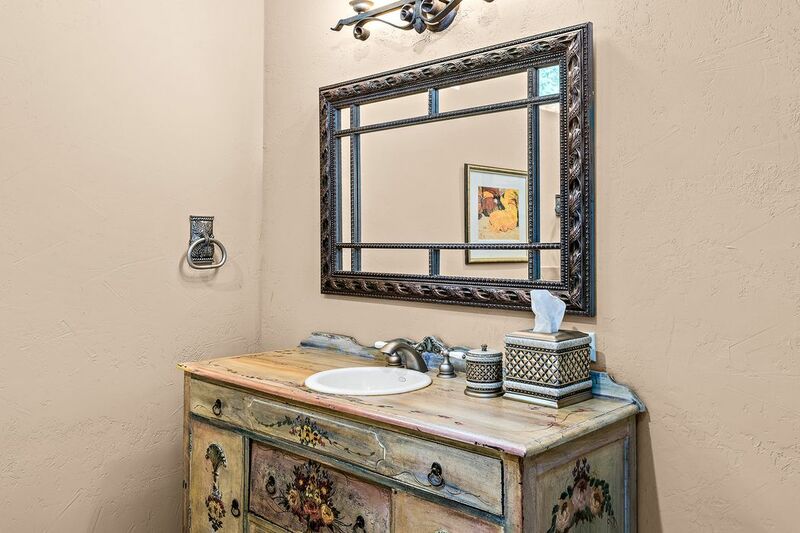 Vintage furinture like sink displayed in a secondary bathroom. 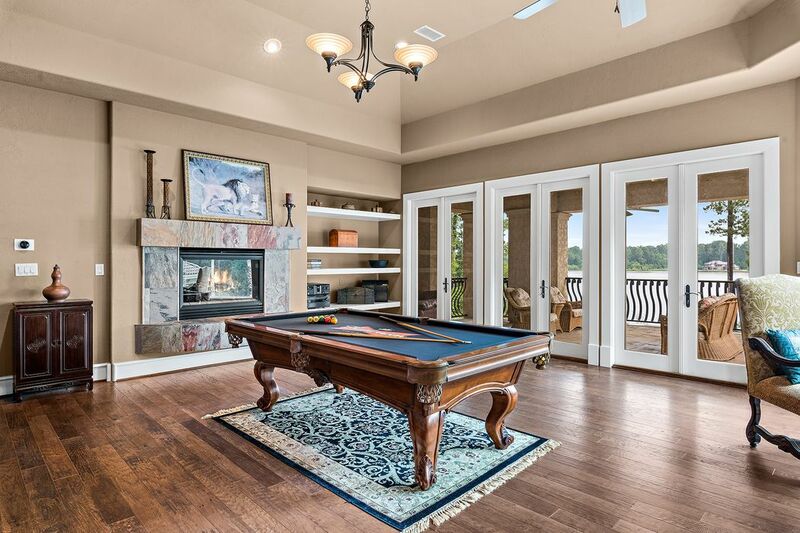 The game room - which is large enough to hold a billiards table and then some. 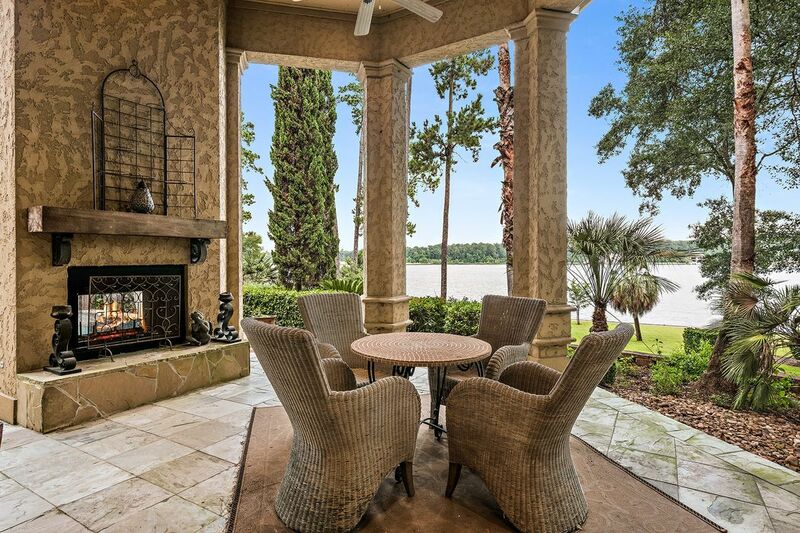 Displays a custom stone mantel fireplace, french doors, access to yet another balcony and Lake Conroe views! 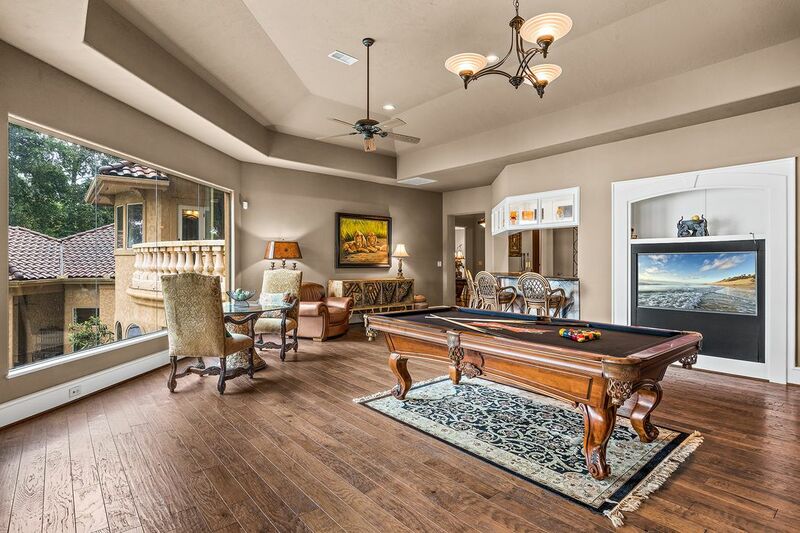 This game room also has an entertainment center and easily accessible built in bar with stone counter tops. One of the many secondary bedrooms with en suite bathroom, wood floors, floor to ceiling windows and doors that open to the private balcony. 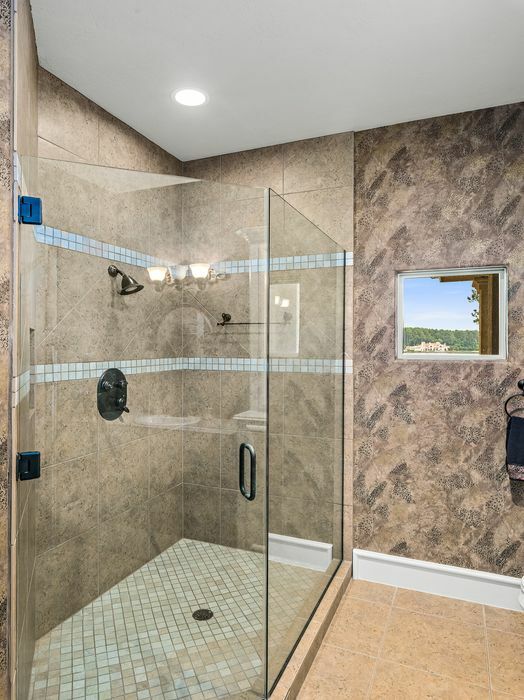 Secondary bathroom with a gorgeous Seamless shower and dazzling tile floors. 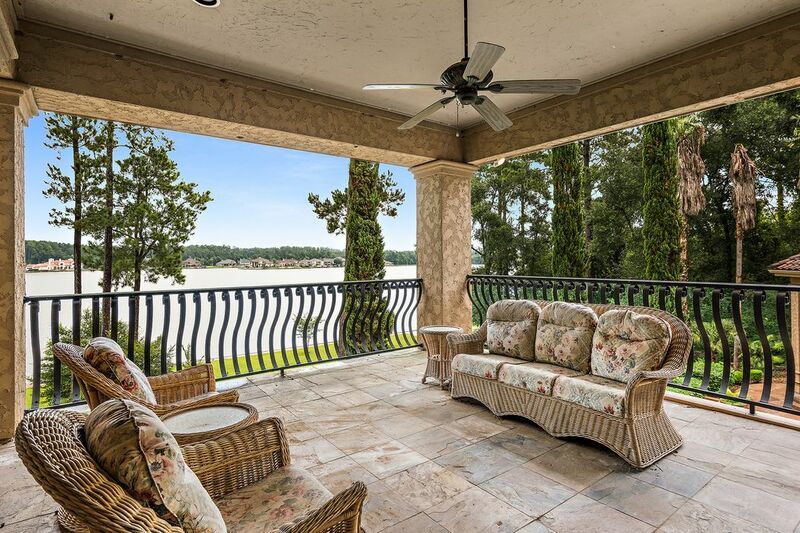 One of the larger balconies located off the game room with travertine flooring and the homes signature iron work. 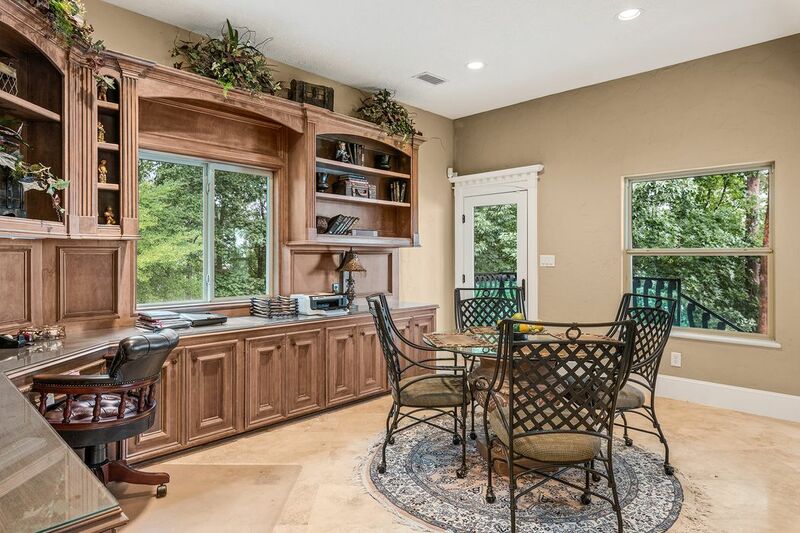 Totally separate living quarters for your guests to enjoy while visiting. 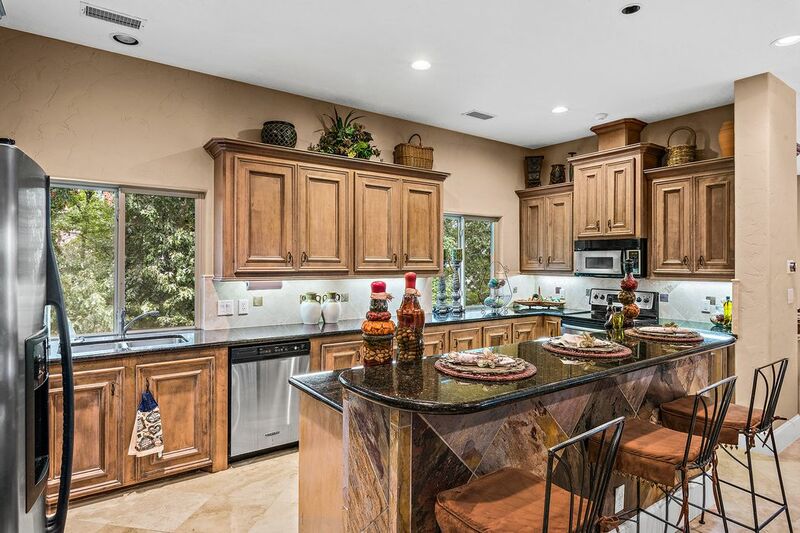 This kitchen is fully equipped with stainless steel appliance, dramatic dark granite countertops, recessed lighting, and beautiful wood cabinetry. Guest quarters living area with beautiful tile floors, vaulted ceilings, recessed lighting, and private balcony access. Guest quarters private study and breakfast nook. 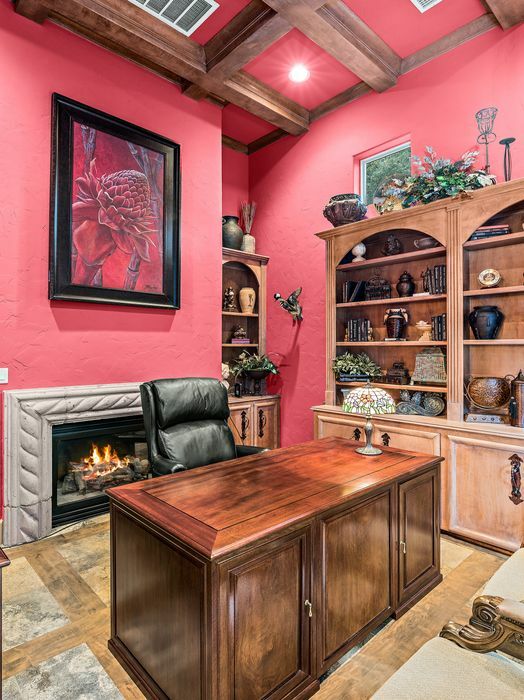 Complete with strong wood built ins and invigorating natural light. 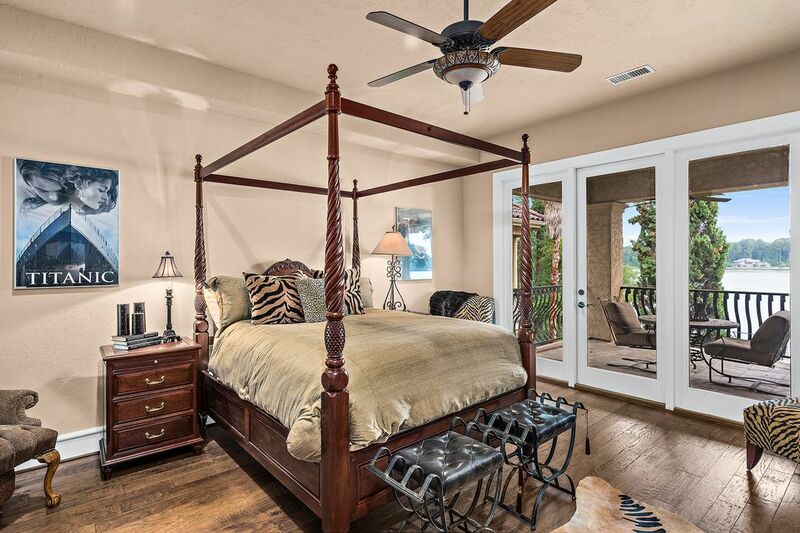 Another guest suite bedroom with vaulted ceiling, travertine floors and novelty french doors that open to the inviting balcony. Guest quarters private bathroom with unique and daring display of dark granite, framed mirror, and natural slate stoned shower. The focal point of the home is the backyard of course, and the dazzling pool, which is easily available from all the 9 balconies. 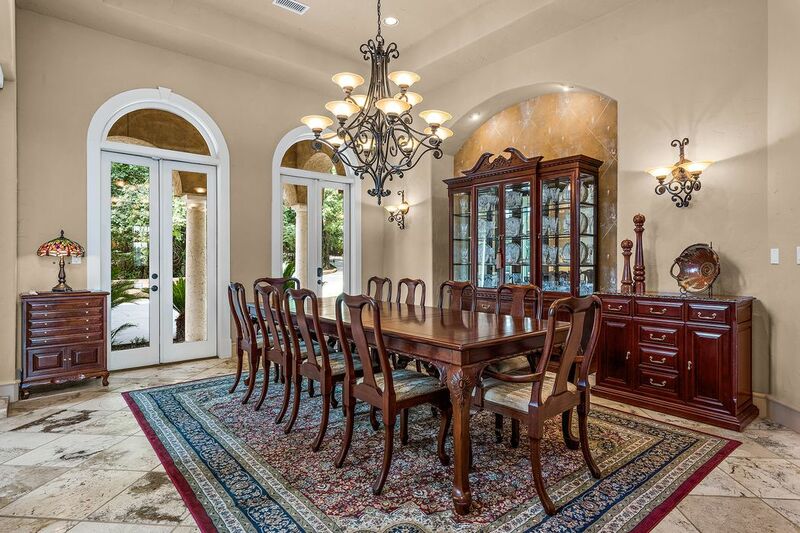 This estate boasts a tile roof, travertine floors imported from Israel, and solid 9 Mahogany doors. 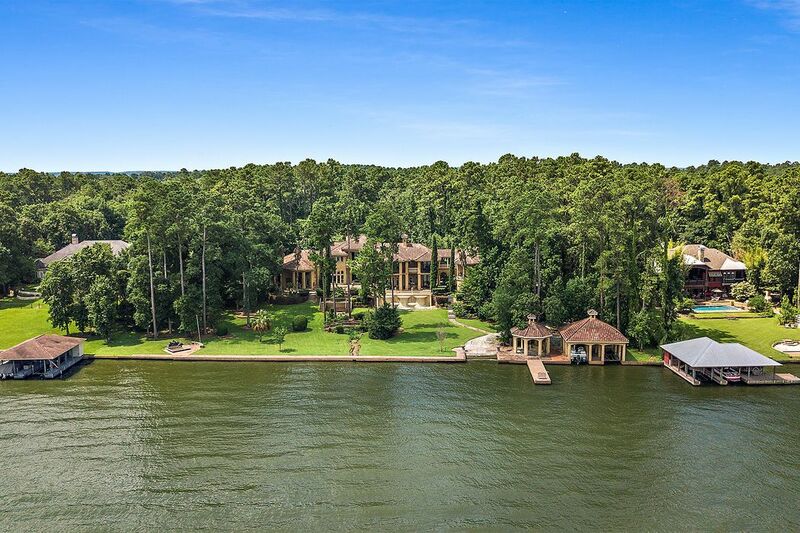 Behind the gated enclave of Laketree, down a private and secluded winding drive lies a jewel of nearly seven acres surrounding a private residence perched on Lake Conroe! 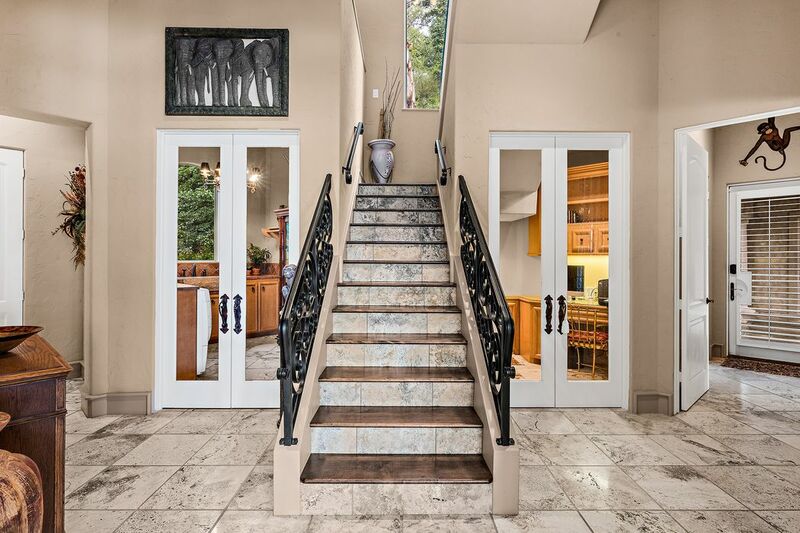 The estate boasts an ELEVATOR and GUEST HOUSE with a separate entry which features its own living area, kitchen, office, bed and bath, also with views of the lake! 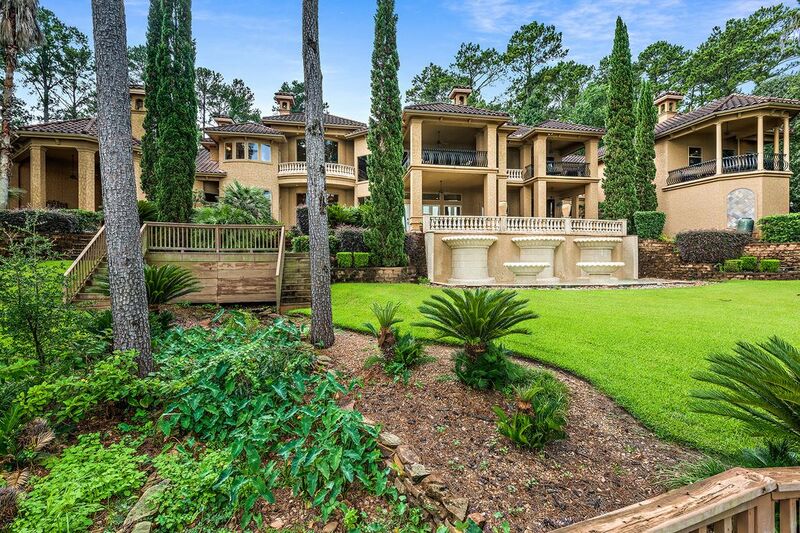 The Italian inspired travertine perfectly edges the grounds making it eye pleasing as well as convenient to walk along the water line or even quick access to hop on a boat or dive in! 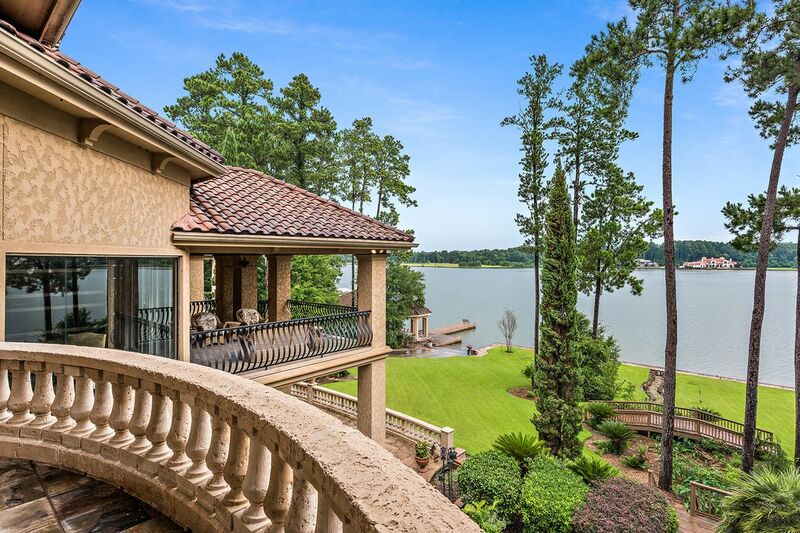 Six generously sized en suites, offering nine balconies throughout and stunning views of Lake Conroe from nearly every room. 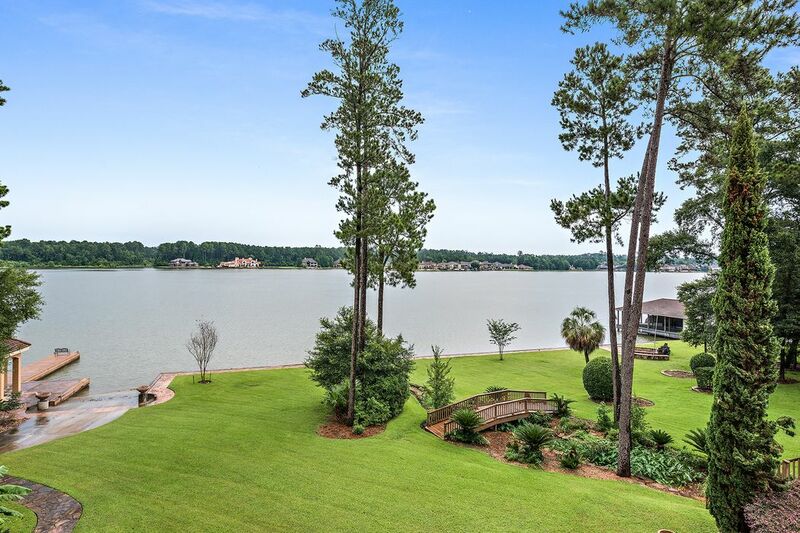 Stroll along a winding pathway from the main house to its own dock for loading and unloading watercraft and a lift for convenient boat storage. 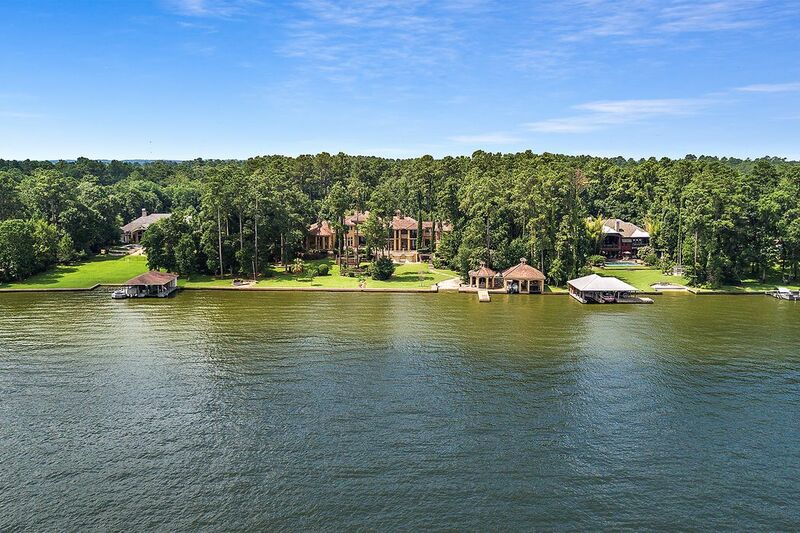 Don't miss a chance to see this one of a kind Luxury Lake Listing! 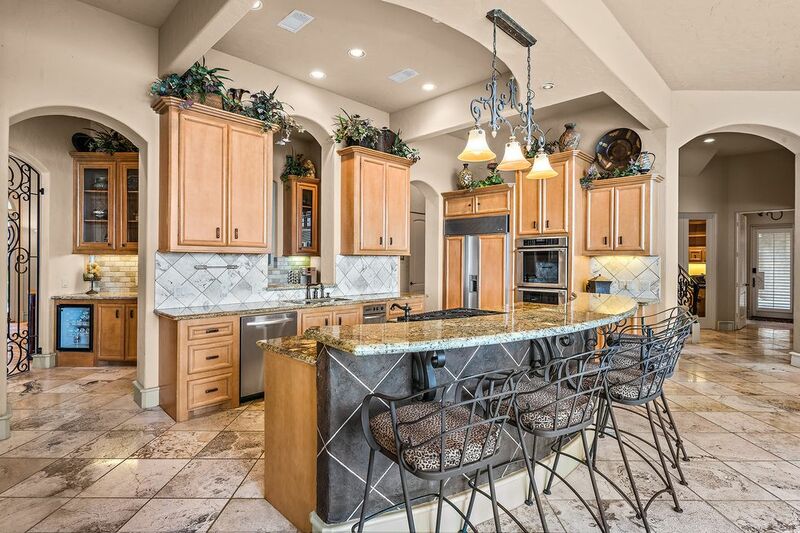 $3,000,000 6 Bedrooms6 Full / 2 Partial Baths9,999 sq. ft. 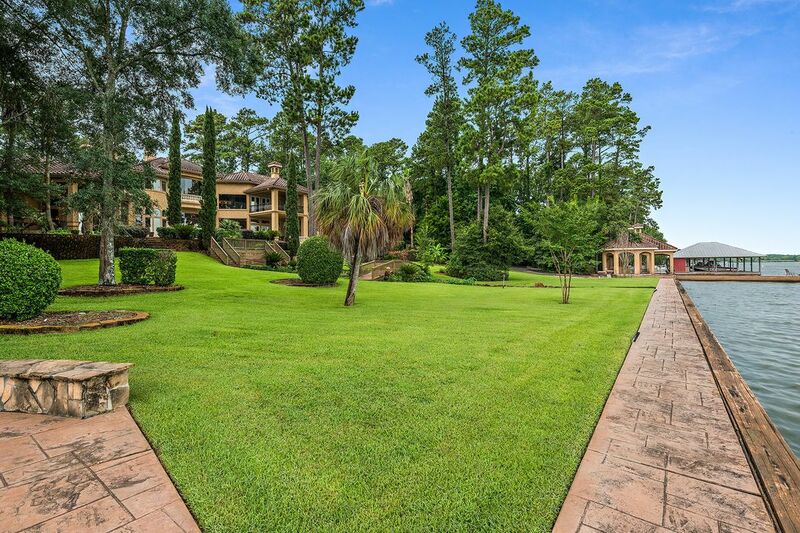 Behind the gated enclave of Laketree, down a secluded winding drive lies a jewel of nearly 7 acres, surrounding a residence perched on Lake Conroe. 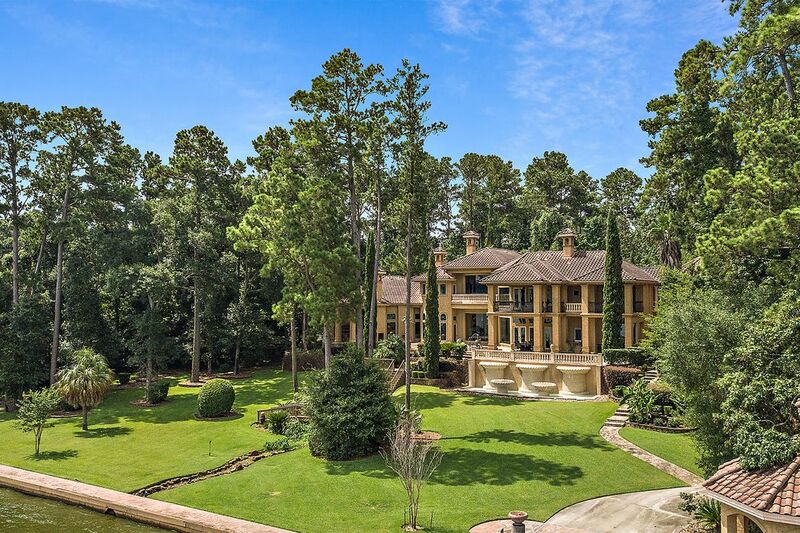 The Italianate Villa is discretely nestled among the trees from the front; it soars majestically and demands attention from all on Lake Conroe. 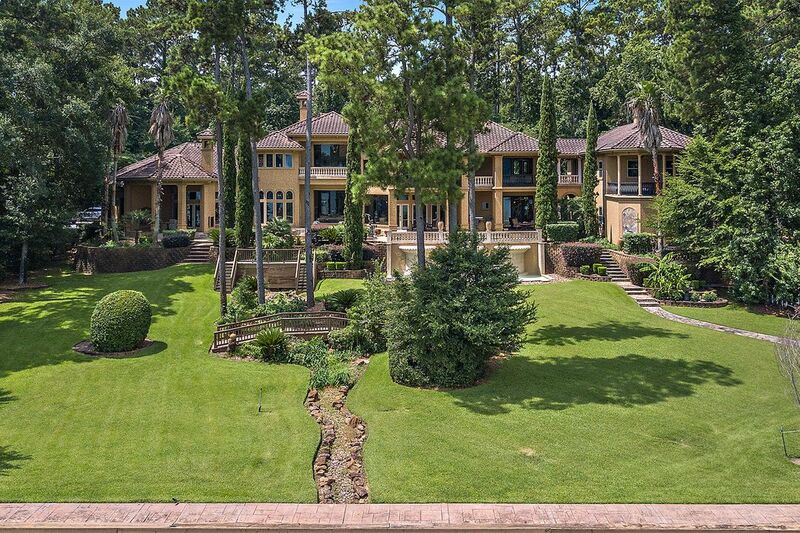 With nearly 450 ft. of bulkheaded shoreline, it is the rival of all lakefront residences. Of course, it boasts its own dock for loading and unloading watercraft and a lift for convenient boat storage. 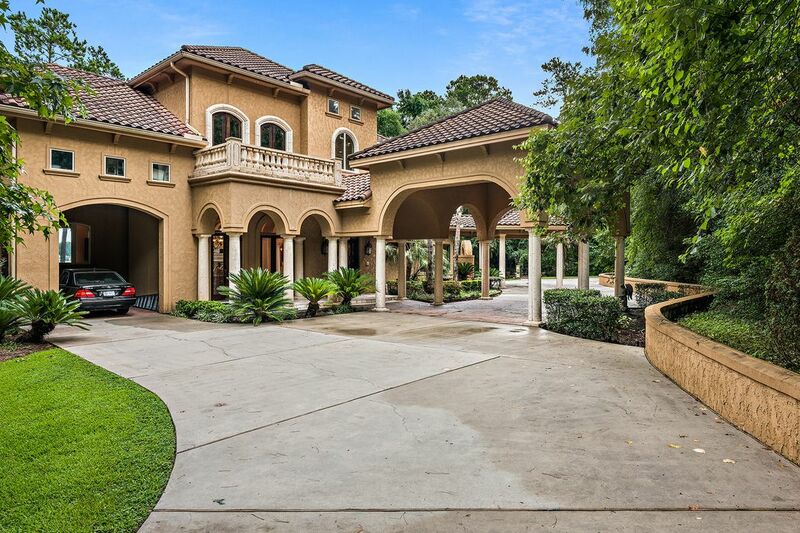 This estate boasts an Italian tile roof, travertine floors imported from Israel and solid mahogany doors. 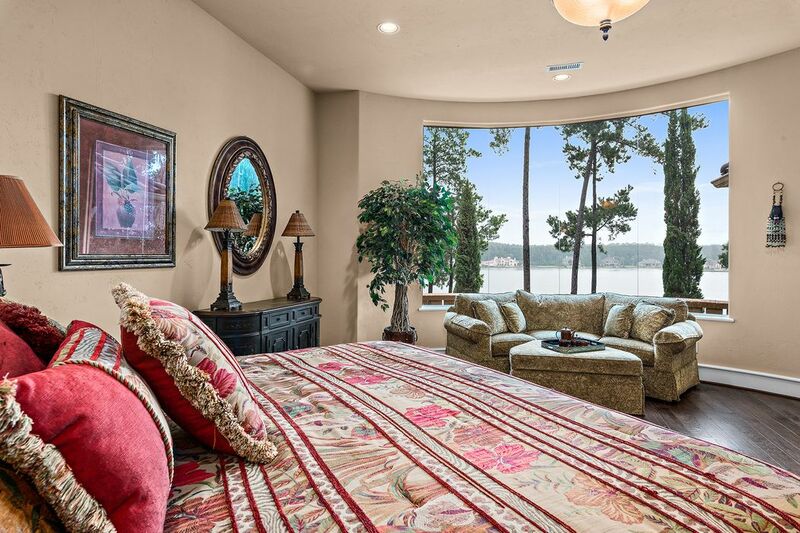 Six generously-sized en suites with stunning views of Lake Conroe from nearly every room. The estate boasts an elevator and guest house with separate entry, which features its own living area, kitchen, office, bed and bath. 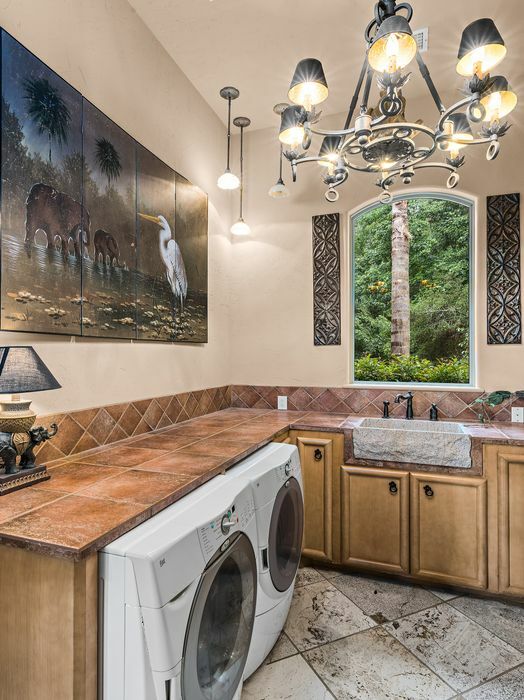 Utility rooms on both levels. Workout room with separate entry attached to the master wing.